You could draw a line from the Romans to Leonardo Da Vinci to Britain all the way to an ordinary afternoon during my childhood when my mom would set out a panino for me when I returned from school. Every time I ate a panino in New York while researching this article I was transported back to that memory of Italy. 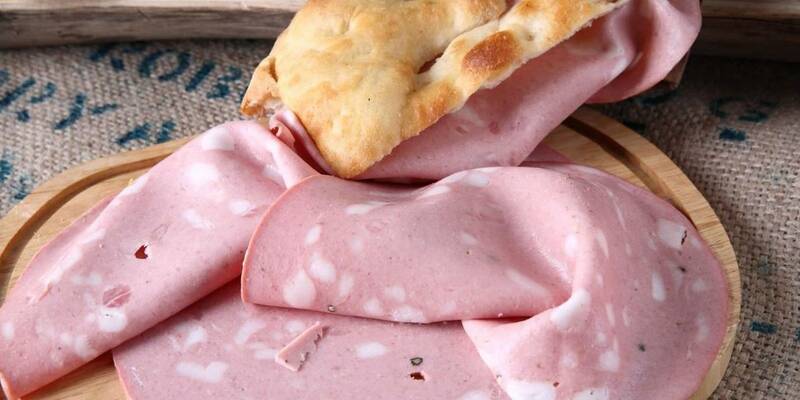 A panino is indeed simple – stuffed bread – but in that small loaf of bread lies the full taste of the Tuscan countryside or the flavors and spices of a folkloric Neapolitan street market. A big taste of Italy in a small loaf bread. Brothers Fabio and Ciro Casella are an institution in the world of Italian restaurants in New York. San Matteo, their historical restaurant which brought the best and most enduring traditions of Salernitano cooking to the city, is a bona fide little Italy extravaganza. It’s hard to find a more rustic Italian place in the city serving stellar products and providing elegant service. In the tradition of San Matteo, Il Salumaio takes the Casella business to new heights and new standards of luxury service, introducing the most refined selection of Italian wines along with classic dishes from the Neapolitan area. They have a wide selection of hot and cold panini made with the freshest ingredients on a hero, ciabatta or focaccia. One tasty standby is “il Salumaio” (prosciutto, fresh mozzarella and roasted pep- pers). For a more sophisticated palate, savor the “Bari” (dry cured filet mignon, Parmigiano Reggiano and Arugula). But you can’t beat their hot eggplant or chicken parmesan Panini – Fabio and Ciro score the best parme- san in the city. This elegant wine bar and restau- rant boasts an enchanting backyard patio and serves great Emilian cooking. Chisolino, fried focaccia, is the unique ingredient of their gourmet panini, reinterpreted with an innovative twist. Chef Claudio Meneghini makes his own version of chisolino, modifying the ris- ing process so that the bread has more mollica (the soft inside of the bread). Over this circular shaped, “naked” focaccia he spreads ingredients like robiola cheese and black truffles. Another version is the co-called pizzolino made with the crunchier part of chisolino and baked like a small pizza, with tomato, mozzarella, oregano, and topped with pesto – a favorite with the kids. A sinfully delicious chisolino with nutella is also available as a late night snack after 11pm. Antica Salumeria Rosi Parmacotto was founded in Parma in the early thirties by Cesare Bocchi, an enter- prising businessman who had the idea to open a trattoria with an ad- joining salumeria next to it. It was an immediate and long-lasting success. During the sixties Bocchi sold his business to Faimali, a pork butcher who helped make the trattoria a com- pulsory stop for anyone passionate about good cooking and traditional products from Parma. Later the Picchi sisters arrived, and in 2008 Parmacotto bought the business, transforming it into a trendy global brand. Now the best in Parma’s cuisine is just a train ride away. Super fresh ingredients are the simple but massive trend of this salumeria, offering a selection of panini assembled right in front of your eyes to preserve their “just-cut” quality. Their signature sandwiches are made with homemade focaccia. 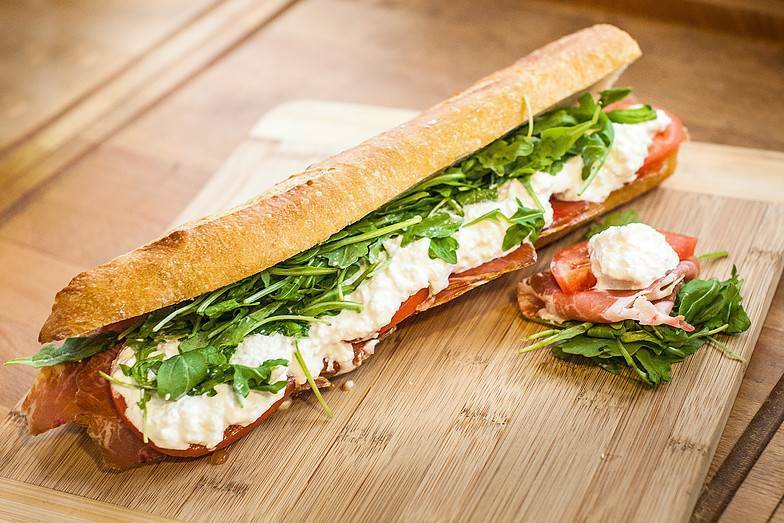 Along with the famous Prosciutto di Parma, you certainly don’t want to miss their exquisite bresaola panini. In the heart of Italy, the scenic Val di Chiana appears to be the place where all the exquisite food and wines have been kept, and it’s not a secret anymore. In their new home, under- ground gourmets Luca Meacci, the Tuscan restaurateur who moved to New York twelve years ago, fueled by the American dream, met Luca Paci, another Tuscan who shares with him the same passion for Tuscan cuisine. Casa Toscana, an offshoot of Meacci’s successful “Gelato Ti Amo” in Lower Manhattan, imports all biological ingredients directly from Tuscany and bakes its own stoneground bread to produce the restaurant’s signature schiacciata (flatbread pizza), both with white and whole wheat organic flour. Tuscany’s idea of a treat. The schiacciata comes in two additional versions: as an open sandwich with raw ingredients, or as a sandwich served hot. They also prepare savory gourmet croissants with prosciutto, cheese and arugula, and the so-called “Tuscan-New York breakfast,” San Daniele prosciutto, shaved Parmesan, scrambled eggs and heirloom cherry tomatoes. This brand new eatery shares the same genuine, friendly and young vibe of the trendy “La panineria” in Greenwich Village. Owner “Super” Mario Pesce exudes the kind of Neapolitan warmth that immediately puts you at ease. You feel like he’s a pal you could chew the fat with over a panino. And this young, driven guy is definitely equipped with super powers. He moved to New York when he was just 22 on a dream and a prayer. Like something out of a movie. One day, while he was enjoying a panino in a park, he had an epiphany. A panino with high-quality Parma prosciutto and a great cheese, he reasoned, is always a pleasure for the senses, and it could be a winning formula in a city like New York where eateries always tend to pile on the ingredients rather than keep it simple. Therein lies the secret of La Panineria. It serves high quality products in freshly baked bread. Easy but tasty. The way a panino should be. Their panino with “burrata” cheese is a specialty you can’t find elsewhere in New York, as are their signature black truffle oil sandwiches. Big on take-outs, La Panineria also provides a useful app for delivery. 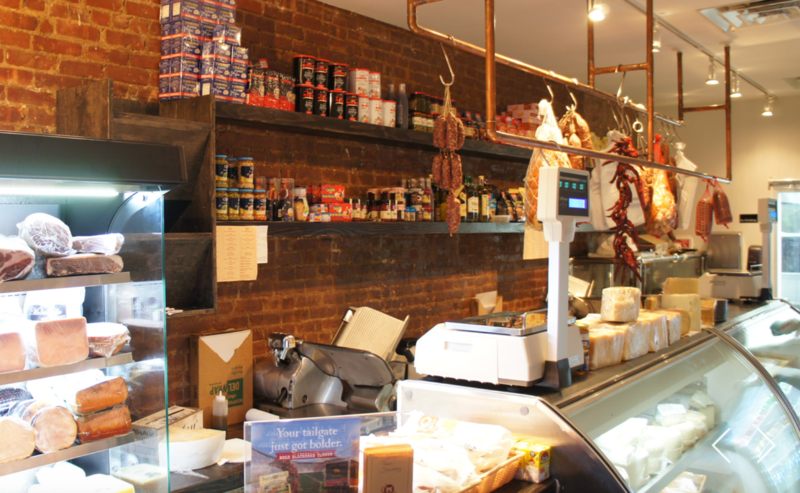 An authentic local salumeria with traditional Italian countryside décor, offering the best selection of cured meats, regional cheeses, pastas and olive oils. In 1970 brothers Giovanni and Filippo Badalamenti brought their mozzarella-making craft to New York all the way from Sicily and started a successful business, first located in Astoria, Queens, and now in the glamorous Hell’s Kitchen area with Giovanni’s sons Massimo and Sergio, who have taken the business to new heights. Their fresh ciabatta crunchy bread is delivered daily from a bakery in Tribeca and used to prepare a vari- ety of 25 different paninis. Their special is Il Vip, prepared with Prosciutto di Parma, fresh mozzarella, spring mix, extra virgin oil and fig spread. It is served with extra virgin oil and a balsamic dressing. This midtown offshoot of the famous sandwich shop in Soho dispenses a wide variety of panini stuffed with mouthwatering original Italian ingredients. Walter Momentè, originally from Venice yet proud to call himself a true New Yorker, comes from a family of restaurateurs who opened this panini mecca in 1986. Every morning he wakes up and goes shopping for the best Italian cheeses, meats and bread to make his signature Italian heroes. “I put the same passion that I have for food into my customers and you can see from their expression they enjoy every bite,” stays Momentè. You definitely won’t be disappointed by the explosions of tastes when you bite into a cold Frugoletto (sopressata, smoked mozzarella, artichokes and arugula) or a warm Fratelli d’Italia (por- chetta, basil pesto, fresh mozzarella, hot sauce, sweet peppers and arugula). This flatbread filled with a variety of Italian cheeses, charcuterie and vegetables is a classic Italian sand- wich inherited from Emilia Romagna cooking. After realizing that piada was completely unknown to the New York culinary scene, in 2004 Giovanni Attilio and Daniele Buraschi, two Emilian piada lovers, joined forces with entrepreneur Sebastiano Peluso, the ge- nius businessman who has been key to building a vast network of supporters of Italy’s traditions in New York City, to open this unique sandwich shop that has become a favorite lunch spot for the business crowd in Midtown. Stop by and get a real taste of Emilia Romagna with the classic “Amarcord” piadina (prosciutto di Parma, mozzarella cheese, arugula) or the “Dolce Vita” (bresaola, shaved parmigiano, arugula, extra-virgin oil). You can also find Piada at the Plaza Food Hall at 1 W 58th Street. Eataly has become a landmark for Italian food and culture, a phenomenon that continues to captivate costumers all over the world. The perfect mix of high quality organic products and Italian gastronomic tradition reinterpreted in a hip and cool environment is also the winning formula of Eataly’s “I panini” counter. Recently revamped in order to identify local New York ingredients like the heirloom tomato from New Jersey, the “I Panini” menu presents a unique combination of Italian and American ingredients served on homemade ciabatta, baguette or piadina. The Campano (heirloom tomato with fresh mozzarella and pesto) is a favorite among the clientele, but there’s a whole variety of different combinations available and you can customize. This summer the menu will capitalize on grilled ingredients like eggplants, mushrooms and vegetables along with cold sandwiches. 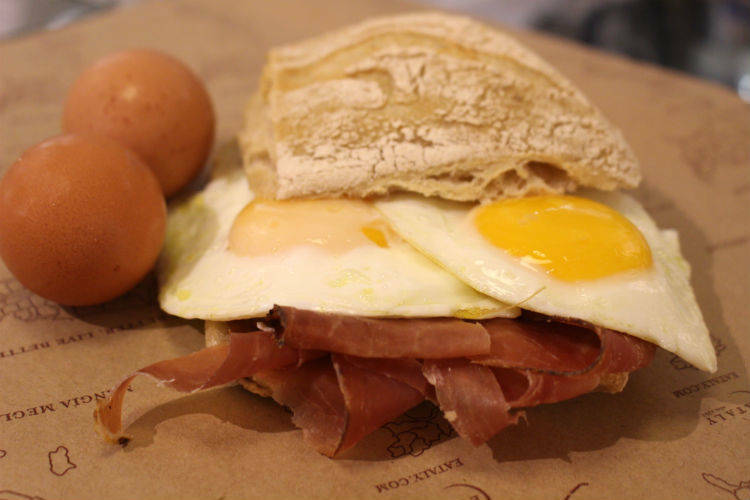 The breakfast panini selection inspired by colazione all’americana is also an Eataly staple, made with wholesome local eggs from Arcadian Pastures, local meats and Italian salumi and formaggi on ciabatta. The personification of earth in Greek mythology, Gaia is not just an evocative brand name for this lovely Italian spot; it’s also the entire philosophy behind how the café operates. Everything from the homemade fresh bread to the non processed foods to the recipes based on the perfectly balanced Mediterranean diet hinges on the assumption that we are all connected to the earth. Milan native Gaia Bagnasco has travelled across her native region to collect its gastronomic secrets and bring them to the Big Apple. Gaia’s special panini is made with panfocaccia (thin, crunchy and cracker like toasted bread) is filled with different combinations of ingredients. The famous Milanese – chicken cutlet, arugula, tomatoes and pesto sauce – is a classic. If you’re feeling weary, take a break with a fine cup of Illy Espresso and a tantalizing Nutella pastry. A traditional Italian mom and pop shop, Di Palo’s established a reputtion over the years as being the best dairy shop for Italian cheese in New York. Originally from Montemilone, Basilicata, South of Italy, Lou di Palo, the owner of this old- fashioned latteria, comes from a generation of Italian immigrants that settled in Little Italy in 1903. His great-grandfather Savino Di Palo, a cheese maker, started the busi- ness which he later passed down to his daughter Concetta and her husband Luigi, who imported all of the best high quality cheeses from the south of Italy like Caciocavallo, Provolone and Pecorino Romano. The shop has survived the test of time, having witnessed several wars and the Depression. It remains an undeniable gem, not only for the quality of its food but the history it stands testimony to. Like an Italian kid on his school break, you can go to Lou Di Palo and ask for a simple traditional Italian panino. Some of their specialties are panini with fresh roasted porchetta on rosetta bread, fresh made and cubed with sea-salt; or the pizza Bianca, with rosemary, sea salt, olive oil spread. Add prosciutto cotto, mortadella, provolone dolce or fresh mozzarella. Located in the heart of New York’s Financial District, Pisillo Italian Panini is a gastronomical jewel, the number one Italian fast food joint on Tripadvisor’s list, and one of New York’s mayors favorite places to lunch. Owners Car- melo Nazzaro and his wife Antonella Silvio opened the place in November 2012, the month de Blasio was elected. Coincidentally, Silvio’s hometown, Sant’Agata dei Goti, Naples, is where de Blasio’s grandfather Giovanni came from. Let’s just say the Nazzaro’s journey was written in the stars. The couple fought hard to promote their idea of an authentic Italian panineria, which is not to be mistaken for a restaurant or a deli. Proud of the fact that they maintained their Italian name and their brand in a jungle of fake Italian delis, they have often been imitated but never matched. Carmelo, a professional buyer of high quality products, knows exactly what is fresh and genuine. He imports everything from Italy. Buffalo mozzarella from Naples, prosciutto from Parma, Südtiroler speck are combined with fragrant bread delivered daily from one of the finest bakeries in Brooklyn, which has been in the business for 30 years. .
Those qualities run in the family and are the key to the brothers’ success: Da- vid won the prestigious “Throwdown! with Bobby Flay” challenge, and their devoted clients include Hilary Clinton, Robert De Niro and Leonardo DiCaprio. Their sandwich menu appears tradi- tional and original at the same time, a unique fusion of Italian-American tastes and stellar quality products. Each panino has a specific story be- hind it, like the “Hilary Clinton favorite” made with salami, smoked mozzarella, sundried tomatoes, sweet peppers and olive oil on Italian bread. Or the Paula Deen, with prosciutto di Parma, hot so- pressata, radicchio, fresh mozzarella, sun-dried tomatoes and truffle oil on focaccia. If you’ve never had the chance to taste the typical piadina in Northern Italy’s Romagna region itself, don’t miss Lella Alimentari, one of the very first authentic piadineria in NYC. Massimiliano Nanni, affectionately known as Chicco Piadina, has transported the goods from his mother’s “Piada e Cassoni dalla Lella”, one of the most famous Rimini piadinerie, to Williamsburg, with his cozy, familyrun bistro. 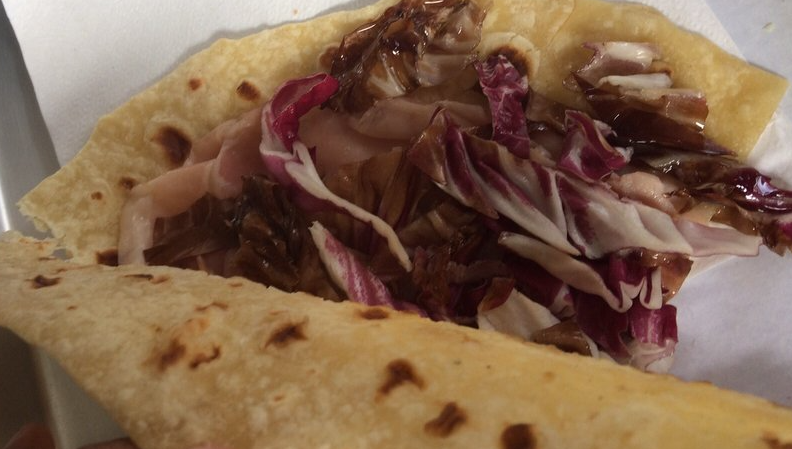 A piadina is a variation of the typical Italian sandwich. 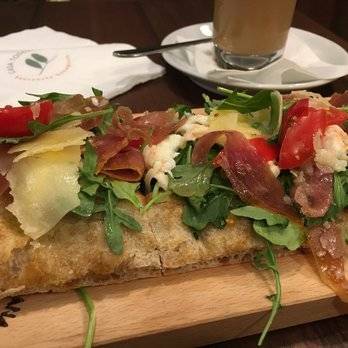 Composed with thin flatbread (made with white flour, lard or olive oil, salt and water), it’s usu- ally stuffed with prosciutto di Parma, stracchino (Italian cow milk cheese), and arugula. Among the many varieties of piadina on the menu, this summer you’ll fall in love with the seasonal heirloom tomato piadina. Great fresh ingredients are shipped in every month from the West Wind Orchard Farm upstate. If you’re keen on sweets, make the Nutella piadina your new naughty pleasure. Three Italian brothers decided to in- troduce their mamma’s home cooking to Staten Island. They keep it simple, offering large portions in a cozy family- style atmosphere. Their just-heated, pressed, brick-oven bread – acquired daily from Royal Crown Baker – forms the foundation of 32 varieties of Ital- ian sammies served on a panini, focac- cia, hero or wrap. Portions may be big enough to split but you’re going to have a hard time sharing some of the Grill’s delicacies, like the “Turkey Artichoke” (caramelized onions and artichoke) or the “Rosario Protein” (grilled chicken, white beans, avocado, broccoli rabe, Swiss cheese and chipotle mayo). With a day’s notice you can order a 3, 4, & footlong hero – brick-oven bread filled with vegetables, Boar’s Head meats and cheeses or chicken cutlets. Their prix fixe Sunday brunch and dinner is perfect for family events.